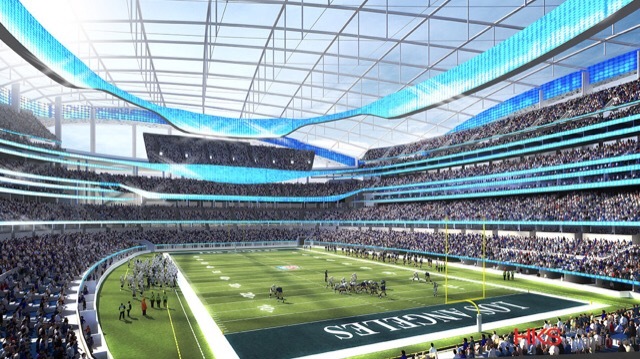 Los Angeles 2024 bid officials said Wednesday they are “thrilled to welcome” the construction of a $2-billion-plus, state-of-the-art football stadium in Los Angeles. On Tuesday the National Football League approved the relocation of the St. Louis Rams to Los Angeles, returning the team to the community that supported them from 1946 until 1994. The team will play in a temporary home next fall with its permanent venue scheduled for completion in 2019. The new, privately-financed stadium in Inglewood in the Greater Los Angeles area, is centrally located five km from LAX and 11 km from downtown Los Angeles, It will be covered by a transparent roof and seat 70,000 to 100,000 spectators, depending on the seat configuration. LA 2024 Chairman Casey Wasserman said, “the best sports city in America just got better. On behalf of LA 2024 we are thrilled to welcome the news that the NFL’s Rams will be returning to Los Angeles and playing in a brand new state-of-the-art stadium in the 2019 season. The Rams and their elite facilities will be another asset to LA’s already world-class sports portfolio, and another demonstration that Los Angeles offers compelling sporting and commercial opportunities. It is for good reason that LA is home to ten professional major league teams and over 1,000 Olympians and Paralympians”. He added, “the wealth of existing and planned infrastructure in the City of Angels means LA 2024 has the luxury of selecting the best choices for the Olympics and Paralympic Games, not building them from scratch. And the new NFL stadium represents an opportunity to add to the array of high-quality venues we already have in our Games Plan”. For the Olympics, the new stadium could support soccer or ceremonies and will help complement the iconic LA Coliseum. Los Angeles is hoping the International Olympic Committee (IOC) will select the California city ahead of rivals Budapest, Paris and Rome to host the 2024 Olympic Games.